This year’s festival came to a close with a salute to the man Eddie Muller called not a noir actor but a noir artist: Richard Widmark. 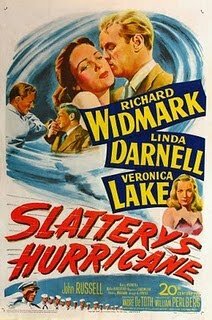 I’d been itching to see Slattery’s Hurricane since reading Eddie’s article about it in the Noir City Sentinel, the magazine of the Film Noir Foundation. It’s the least known of Widmark’s films from this era, and is also the only original screenplay by novelist Herman Wouk. Here’s your slambang opening: Widmark’s Slattery coldcocks a guy, steals a plane, and flies directly into the titular windstorm. The ex-Navy pilot then reflects back on the life that brought him to this point. Think of it as a borderline psychotic version of The Spirit of St. Louis. The long chain of circumstance involves Slattery’s fragile girlfriend Veronica Lake; his ex-lover Linda Darnell, now married to an old pal; and a “candy” company that didn’t hire Slattery to fly to the Caribbean to pick up cocoa leaves. Very adult stuff, so naturally it ran head-on into opposition from the censors. Eddie correctly called this “a wounded film,” with much of the strongest material excised or heavily edited. Still, those phantom limbs are felt. You can see the movie that Slattery’s Hurricane was meant to be, even though it doesn’t play out onscreen. Widmark’s bristling performance holds the enterprise together, as do the harrowing flight sequences; director André De Toth was a pilot, even though he only had one eye. Lake, then married to De Toth, appears without her trademark hairstyle and is shockingly vulnerable. She would never star in a major studio film again. Next: Pickup on South Street, one of the best B movies ever made and one that lost its FBI seal of approval because of writer/director Samuel Fuller’s affection for characters scrabbling out an existence in the margins of society. We’ve seen Pickup several times, so we skipped the screening to have one last round (or two) of drinks with the Czar of Noir and settle up. Rosemarie and I sold hundreds of dollars worth of FNF merchandise during the run of the festival, and were down to the dregs by closing night. It may not be as impressive as the haul the Foundation takes down during Noir City San Francisco, but that festival is in the 1400-seat Castro Theater and has cigarette girls moving the merch in the aisles. Seattle had two people at a table, and that cigarette girl costume chafed something fierce. My thanks again to Eddie, the FNF, and SIFF Cinema for what has been the most successful Noir City Northwest yet. Great films and strong turnouts all week long. It’s an amazing feeling to watch rarities like Slattery’s Hurricane or Wednesday’s Fly-By-Night and realize that the only people in the world seeing that movie on that day are in the room with you. Time for me to catch up on some more current movies.